April in Paris has had its praises sung (often by me) but I would like to note that April in Cornwall is fresher and greener, its air perfumed by the sea and not by buses and motorcycles, the peace and quiet of its countryside a balm to the soul of the city dweller. I have recommended Dacey’s Cornish Tours to French friends as the perfect way to get away from the crowds who flock to Paris in April. Last April I visited Cornwall with Dacey’s Cornish Tours. The azaleas of the Lost Gardens of Heligan were astonishing—so many! so bright! so big! But it is not the flashier flowers that I remember most fondly now but the little wild ones growing in the lawns and along the roadsides. The white ones look like tiny daisies and are as common as the dandelion is in the United States. Wild primroses are also scattered here and there showing various shades of rose and yellow. 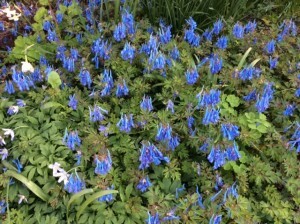 In some places small bright blue flowers grow in shady places. None of these appear to have any attention from gardeners other than an occasional mowing along with the grass. Ferns were sending forth their first tender fronds and heather was coming into bloom as we walked the pathways to the Eden Project. 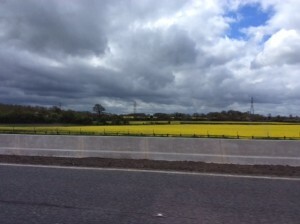 Traveling from place to place by van we admired field after field of bright yellow flowers: rapeseed or canola plants. Spring grew greener and more luxuriant day by day and when we returned to London we discovered a green Green Park.